Spending $2,000. to produce a video explaining DPCA finances is a better idea. according to ALL BOARD OFFICERS i.e. MANY, MANY financial irregularities exist in the DPCA books - from the Pomona National all the way back to the 1990's - good business practice demands an audit be performed regularly - its too expensive NOT TO AUDIT IMMEDIATELY. Poll results - BoD performance = 50% "They are failing" 50% "They are doing more wrong than right"
Do you support the 501c3 BoD run charity? ARCHIVE CLOSURE- Jan Van Wormer said it could take up to a year. She said this in 2009. It is over four years and counting? 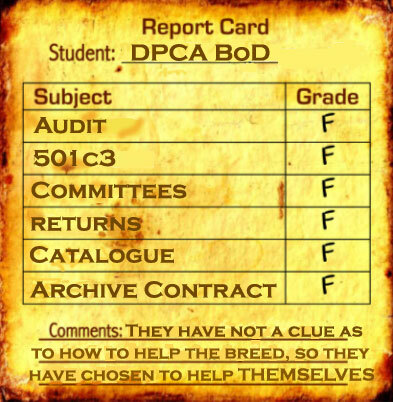 RETURNS - of unwanted archival materials to the DPCA from the AKC should have occurred. The members await the Bod Report. It is over four years and counting? CATALOGUE - of DPCA archives is NOT online as promised by then President Jan Van WORMER. It could take up to a year president Van Wormer said in 2009. It is over four years and counting? CONTRACT - between DPCA - AKC "would be signed and available for the membership to see" is what President Van Wormer promised in 2009. It is over four years and counting? It is widely recommended that nonprofits especially conduct annual audits to insure their $$$ house is in order. Sound business practice for the DPCA indeed. WHY? In 2000 Marquis Ryan, CPA pleaded with the DPCA Officers to put a chocker on then Candidate DiNardo for his constant harassing and haranguing the CPA firm for information about the ongoing election. Do you believe that the CPA firm would have continued doing business with the DPCA, all balloting AND preparing the tax filings for the IRS for 10+ years if they had not caved to the DiNardo pressure? Put the DPCA house in order to restore the member's trust, change the CPA firm, NOW! 2. Return to 501c7 tax-exempt status. WHY? It would return the "protect and preserve" direction to the DPCA. It would permit the business of Doberman Pinschers be first and foremost rather than serving as a satellite of the AKC, donating to ALL their causes and diminishing the DPCA capacity to serve the Doberman Pinscher first. It will return the club to the single purpose it was founded as - the breeding and exhibiting of superior Doberman Pinschers. WHY? Chairs to committees have been used as a political tool to compliment the empire building regime that has occupied the DPCA Officers & Board seats for 10+ years. Make sure all DPCA committees are chaired by people who uphold, defend, exhibit and promote Doberman Pinschers as a cropped and docked breed. If those committee positions cannot be filled by members who promote the standard as is, then abolish those committees! Some committees have only a chair and no other members, many have NEVER filed a report, and most do little to nothing actual productive work. Abolish those committees! Past Treasurer Robin Kelly handed out a booklet entitled "Guide for Board Members". She talked to the Board about fiduciary responsibility and the Club's 501(c)(3) status. Could some of this be what Robin is referring to? I move that the President may approve expenses up to $500 without Board approval. To make a $5000 donation to NAIA (National Animal Interest Alliance) as has been done previously. Sandy Teague was called upon to discuss the Meet the Breeds Booth at the AKC/Eukanuba competition, Sandy has researched the needed custom materials. The booth will be open to walk through and will contain information about Dobermans. Top 20 Chair, Joni Kahn, agreed to submit names of Top 20 conformation judges to the Board for review. If you'd like file a complaint - 2undoit - is proud to link to the IRS Complaint Form HERE.